Apologies :- Sultan, Khadija A., Amber P., Sarah N., Afsana K., Nathan W., Katie W.
Jade started off the meeting with good news. Cepheus brought to the attention about the Officer Roles which are up for election the meeting of 25th July 2018. First role talked about was Multi-Media. ConsultationConsultation is when members of an organisation gather information/feedback from members of the public or group on a project or scheme. from the current holder, Khadija A., has come back to say scrap it. 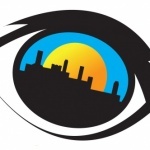 As the role is focused around creating photographs and images for social media and the website, it could be just utilising youth councillors who have the skills instead of having a role. Events and Outreach has been recommended to stay the same. As Katie R. enjoyed the role and felt it worked well with its purpose, the role will stay the same for the next election. Communications had mixed feelings. Liam H. expressed how he felt the role had a good amount of work and tasks, others worried that other candidates and elected officers would not be able to do all of the work. This discussion led to the suggestion of removing the minuting from the communications role, to ease the workload. Liam disagreed with that due to the minuting linking in with keeping people updated and answering peoples questions. After a discussion, it was voted that the role would stay the same. Priority leads were discussed, and what the purpose of each lead was. The roles came in at a time where much of the work of the campaigns were done, meaning their roles couldn’t be done. Youth councillors also felt that they didn’t know about any work that was being done in the role, asking for better communication. Chris gave a staff point of view, that the roles didn’t really work and a Campaign Lead should be created. A campaign lead would be the oversight of the campaigns, asking youth councillors to do tasks for campaigns. Agreement went around the room and was voted in, replacing the priority leads. New roles are being discussed, with the idea of a social secretary being first. A social secretary would organise fun events for youth councillors. Organising team building activities and fun movie nights, some examples, this would allow better social time for youth councillors and allow them to get to each other more. Another role that was being talked about was an Inclusivity role. Inspired by the Youthforia An organisation in which youth councillors from the North West meet up and work on campaigns and training. role, this role would aim to include everyone in meetings. After discussion, the idea of adding inclusivity to the role of Vice ChairThe Youth Councillor who runs the meeting, heads up the organisation and has the casting vote. Or something to sit on but probably the first one on our site :-)... More would allow the role to be more utilised. It was voted in favour of adding inclusivity to the role of Vice ChairThe Youth Councillor who runs the meeting, heads up the organisation and has the casting vote. Or something to sit on but probably the first one on our site :-)... More. Chris wanted to thank the Youth Councillors who helped out and baked for the Equaliteas party. With the low amounts of applications for the Poland Trip, the applications have been open to all members of Youth Council. Listen To The Earth is an educational trip that allows Youth Councillors to learn about the effect of the HolocaustThe Holocaust was the mass murder of six million Jews and millions of other people leading up to, and during, World War II. The killings took place in Europe between 1933 and 1945. They were organised by the German Nazi party which was led by Adolf Hitler.... More in Poland, by going around monuments and educational sites in Poland. 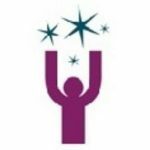 HEALTHY YM CONSULTATIONConsultation is when members of an organisation gather information/feedback from members of the public or group on a project or scheme. 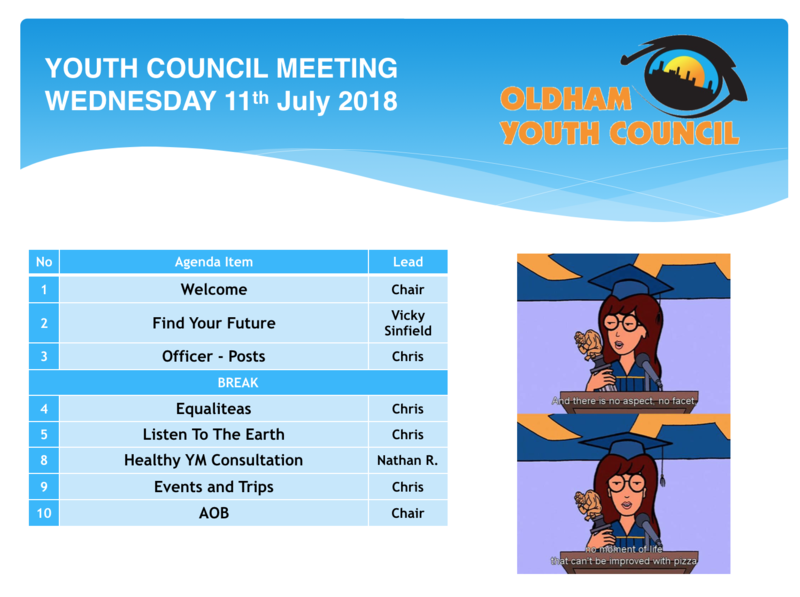 Nathan R. from Oldham YC gave a consultationConsultation is when members of an organisation gather information/feedback from members of the public or group on a project or scheme. from Healthy Young Minds about their services and social media use. The link: https://www.surveymonkey.co.uk/r/SHXSPHG. Events and trips were given to Youth Councillors. Chris gave out the Ten Forward consultationConsultation is when members of an organisation gather information/feedback from members of the public or group on a project or scheme., asking youth councillors to ask ten young people about work experience, to help the OYC Oldham Youth Council Work Experience priority.